Neither side were able to establish any significant lead on an emotional night for the Aggies with a moments silence before the game held in respect of Aggies player and Juvenile mentor, Michael McLean, who passed away recently. The game started slowly with the Aggies coming away with the best of the initial encounters. Declan McLarnon and the rest of the Aggies full forward line caused all manor of problems for the Ógs defence and stacked up a lead of 0-03 to no score. Stephen McCaffrey and John Paul Dunney knocked over points to bring the Ógs back into the game but the sides then both traded points to bring it to a 0-05 to 0-03 to the Aggies. A well-taken goal from Ciaran Rice gave the Ógs their first lead in the game. The game could have changed just as quickly again as some sloppy defending from the Ógs left the Aggies through on goal but for a brilliant save from ‘keeper Rowan Vernon. The Aggies however were able to slot over another point to bring the game level at half time, 1-03 to 0-6. The Ógs started strongly in the second half knocking over two quick frees from Eamonn Wilson and points from Fra Grimley and Elliot to gain a 4 point lead. However, the Aggies were right back in it when Declan Crummey fed the onrushing Conor Caldwell who buried to the net to bring it back to a one-point game. The Ógs were however able to restrict the Aggies to one more point and two points from Conor McKenna and Grimley sealed the win for the Ógs. 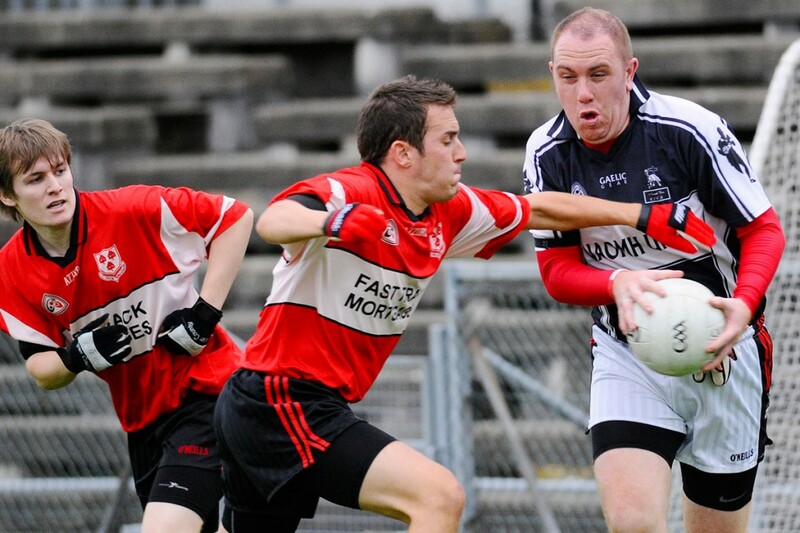 Elsewhere, O’Donnell’s have the opportunity to make it two Junior titles in-a-row as they overcame Ballycastle by 1-10 to 1-5 in the semi-final at Casement Park on Saturday. The St James’ side were in control for the most part and a James Braniff goal in the first half sent them on their way. The West Belfast men continued to pile on the scores with Braniff, Chris Vey, Ciaran McKiddock and Paul McCrory all on target. However, O’ Donnell’s were to finish the game with 13 men after Dennis Austin and Thomas O’Prey were show red cards – O’Prey’s coming just seconds after being introduced as a substitute. The red cards did nothing to affect the outcome as O’Donnell’s always enjoyed a healthy lead and eased into the final where Éire Óg lie in wait.